Recently, we were approached by a member of Centennial Court’s strata council to provide an optimal security strategy for the property, which consists of three separate buildings holding 138 residential condominium units, constructed 25 years ago in Abbotsford. Centennial Court was seeking the lowest cost and most effective security solution that would enable the property manager to be able to ‘add and delete’ keys quickly and easily, in response to regular owner turnover. Older mechanical systems would require that the physical lock itself would need to be changed each time, with every one of those modifications requiring a locksmith intervention. Our higher-tech solution was to install eight Mul-T-Lock Smart Air wall readers on six exterior doors, plus two more for the pool and amenity rooms. 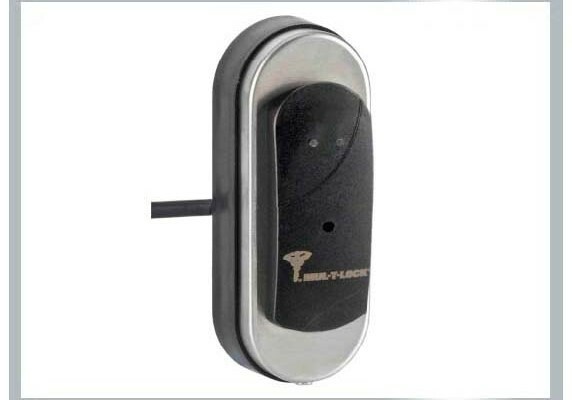 Small proximity fobs were then distributed to all property owners, replacing their keys. The MUL-T-LOCK Smart Air software and handheld programmer unit satisfied the customer’s requirements to be able to quickly delete key fobs, restrict individual access as needed, and obtain audit trails. As another alternative, hard-wired systems would have incurred an extremely high labour cost for installation in the buildings, which weren’t pre-wired. Linking the three buildings would have represented another financial hurdle. And in terms of ongoing management, replacing lost cards is cheaper and faster than replacing a lost key. Plus, the system is easily expandable to secure more doors, such as service rooms, storage lockers, and even control elevator access to separate floors in the future. Having proven reliability in more than 20 such systems installed in residential buildings in Abbotsford and Mission, we are confident that this is the superior option to meet Centennial Court’s needs. The solution is backed with a two-year Mul-T-Lock parts warranty, plus our own two-year warranty on labour.